Bob Dylan is no easy cover. His distinctive voice, both vocally and lyrically, make it nearly impossible for many artists to capture the proper temperament. There are even some Dylan lyrics that just sound, well, wrong coming from the throats of anyone but him. Antony Hegarty’s gift for interpreting the music of others, however, has been on its finest display when he picks up the works of Dylan – something he has done several times in his career. Whether it’s taking a well-known standard and re-routing its soul, plumbing the rarer corners for more reverent treatments or taking less considered work and giving it new life, Antony’s channeling of Hibbing’s bard has been breathtaking. His take on “Knockin’ On Heaven’s Door” is extraordinary and “I Was Young When I Left Home” is downright spectacular, but “Pressing On” is a massacre. Depths of the risks Antony takes indeed. But two out of three ain’t at all bad. really enjoyed this. the picture is cracking me up. @Aaron – I agree with you regarding John Doe’s version, but the more I listen to Antony’s version, the more I’m okay with it. My first listen was pretty rough though. I didn’t know what to make of it at first. There’s actually one more cover that you should here… On Jamie Saft Trios “Living the blues” Anthony does the vocals. A cool jazz version. @j. neas I can’t seem to get used to Antony’s version, which is too bad because before this new EP I loved everything Antony did. Why does the world need another version of “Imagine”? 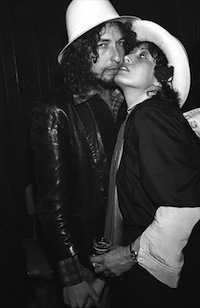 @BillW Few as interesting as Dylan and Antony. @BillW – The head Drunkard and I thought Antony’s covers have been a really impressive part of his oeuvre so far, so we wanted to take a look at those as well as his new record. He’s an artist well worth the exploration. I didn’t talk about his cover of Lennon’s “Imagine” from the same EP as “Pressing On,” but that’s another example of him taking something almost untouchable (ala “Knockin’ On Heaven’s Door”) and really creating something rich. @j. neas Okay I agree Antony’s cover of “Imagine” is lovely for it’s own sake. My dismissal is more a personal bias against John Lennon and The Beatles whose influence, I think, exceeds their worth. Mostly their songs just provide vague warmth with little substance to stand on, unlike artists, for example Dylan and Antony, who are more interesting because their songs are fraught with pain, and are thereby more inclusive of the real beauty of living. I didn’t realize you are the person who wrote this and other posts. I want to say thank you for the smart analyses and superb taste. This blog requires the least work, I find, because you have a piercing grasp for what’s interesting. It takes a lot of work to love music and your efforts make it easy on the rest of us.